I made my first Voila block. I did not pay close enough attention to the pattern and had to do a little resewing. I'm sure the remaining blocks will go smoother, I think I made all my mistakes with this one. The pattern calls for appliquéing the stems, I'm not in the mood for appliqué so I paper pieced them. I am happy with my fabric choices, orange and yellow petals, green stems, and blue baskets. My background fabric is called Paint by Carrie Bloomston for Windham. 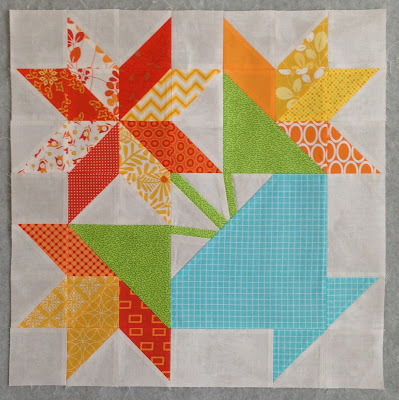 Nicole has accomplished even more, stop by her blog to see her Viola blocks. Love your colors! Any chance of persuading you to share your instructions for piecing the stem units? That is such an interesting pieced block. My favourite petal is the zigzag fabric... that gives some fun movement to the block! A lovely bouquet! I love the colors of the fabrics you are using. I have Viola's Mimosa fabric and have been coveting it for just the right project. Her flowers are looking great so I may keep this in mind for those fabrics. Love your idea of paper piecing the stems. This is going to be so beautiful. I have made the same mistake of not reading all the instructions before I begin as almost every pattern says, right there at the beginning, sometimes it works out sometimes not! Anyway my seam ripper is my friend. Keep on sewing I love watching your progress! Good idea to paperpiece the stems. As you know I'm french, and I want to tell you how proud I am that you name your quilt "voilà" instead of viola ! Good luck for the remaining blocks. Very cheery baskets and smart idea to paper piece those stems... think Nicole also had some issues with her first block. Looking good! !